I was interested in Ken’s article “Snippet from the past 1” as my sister had piano lessons from a Miss Bright of Church Road, during the late forties/early fifties. The 1929 Electoral Register shows: Lydia Bright, Church Road and Charles Frederick and Ellen Bright, at “Glenhurst”. Church Road which leads easily to the assumption that Lydia was their daughter. However, this was not so because their daughter was Norma. At first I thought Lydia may have been a cousin so decided to trace the family. Once again this was incorrect as the two families appear to be unrelated and were living in the same road by pure coincidence. The Bright family have been associated with Church Road for several decades. I have traced the family back to the 1841 Census which shows Thomas Bright age 20 (an agricultural worker) and his wife Ann age 19 – newlyweds no doubt. The 1851 Census shows Thomas and Ann Bright living at London Road, Billericay with their four children Emma, John, Charles and Alfred. The 1861 Census shows Thomas and Ann at ‘Laindon Hall’. Thomas is now ‘Farm Bailiff’. Children listed are John age 18, Charles age 16, Alfred age 12 Thomas 9 and Mary Ann age 4. The 1871 Census shows Thomas (Farm Bailiff) and Ann still at ‘Laindon Hall Farm’ with children: Charles 25, Alfred 21, Thomas 18, Mary Ann 14, Fred 8 and Jubel 3. (Alfred married Rachel Judd 1873, Billericay – Rachel’s second marriage). The 1881 Census shows Thomas now age 61 living in Church Road, Laindon (name of dwelling not mentioned) with his son Alfred, daughter-in-law Rachel and their children Thomas age 5, Mary 3 and Bertha 1. The 1881 Census shows Alfred’s brother Charles, also living in Church Road, (house number or name not mentioned): Charles (Agricultural Labourer) age 35, his wife Anne and children: Sarah 9, Charles 7, Alice 4 and Christopher 1. The 1901 Census shows Thomas age 25 (a bricklayer) and Lydia Bright living in Southend Road, Crays Hill Village with daughter Grace Violet age 1. The 1911 Census shows Thomas and Lydia living in Southend Road, Crays Hill with daughters, Violet 11, Lydia 9 and Rose 3. The 1911 Census also shows Alfred Bright age 62 (Stockman on farm) and his wife Rachel living in Church Road, Laindon (unfortunately once again no specific house number or name is given). Plus Frederick Bright age 19 (a “carter” born in Laindon) and David Perry, a gardener and cousin of Rachel. The 1918 Electoral Register shows Rachel Bright apparently living alone in Church Road, Laindon. The 1929 Electoral Register shows Lydia Bright apparently living alone in Church Road, Laindon. Death Record 1931 – Lydia Bright age 63. Lydia Bright, widow (of Thomas Bright), of Crays Hill, Essex died 28th May at The Retreat, Billericay Essex. (Part of St Andrew’s Hospital). Administration London 2nd November to her daughter Grace Violet Hockley (nèe Bright). A bit complicated but very interesting. At least we have traced Lydia’s family, if not the name of the bungalow or bungalows in Church Road where they had lived. Church Hill and Laindon Hall. William.I believe you are totally right about School Lane. Of course you know where you lived. The list I quoted was taken from the 1929 Electoral Register. I have noticed mistakes in other years of Electoral Registers. There is a complete mess up on the 1957 Register concerning Alexandra Road, Laindon and Alexander Road, Langdon Hills. The enumerator must have got confused and combined the two roads together. I could hardly believe my eyes when I first saw it, eventually I just had to laugh. I believe the main objective was to collect the names of those entitled to vote. Their precise address was of secondary importance. Additionally, sometime between the wars, the turning I lived in, named Alexandra Road, became known as part of King Edward Road. That probably made things easier for our postman, but I always knew our turning was called Alexandra Road and from time to time had to try to convince people of its correct name. Such things are most annoying I must admit. Regardless of such irritations, you and I both know exactly where we lived. Unfortunately once inaccuracies are recorded and archived, its highly likely that’s how it will stay. Best wishes. Hallo Nina, From your latest submission I believe that the electoral records for 1929 have suffered from possible adulteration at the records office. I have sent Ian documentary evidence that I lived in School Lane, despite the census stating otherwise. Despite my age, I do know where I lived and my correct address at that time. My father and the Billericay Rural District Council will also have known this when the mortgage showing the address to be in School Lane was effected and corresponds to the earlier land sales. Also the census appears to show there were 44 properties and there were some missed which I remember. This does to my mind seem excessive and I think perhaps the census information has included that of another Church Rd. somewhere. For myself, think there will be no definitive explanation forthcoming in respect of this road which officially never was, if one considers census information to supersede recorded land titles. I remember my gran going to have her fortune told, her name was Sarah Rhind, and she believed every word Mrs Bright told her, and what would we have done without Coopers shop collecting our war time rations and the bread roll for our school snack. I returned to the 1929 Electoral Roll and having gone right through it, found that School Lane is mentioned on just one occasion i.e. Charles Goddard “Alethea”, School Lane. 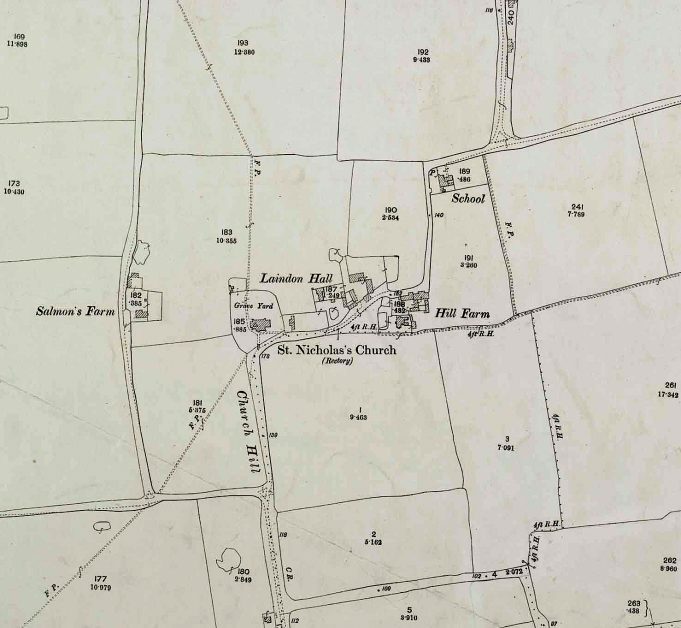 All other names and dwellings are listed under Church Road (in alphabetical order of surname) and there are many of them: Walter Andrews – ‘Delores’. Edwin Baigent – ‘Sulby’. Albert Ball & Robert Clarke – ‘Ivy Cottage’. Louis Barbier – ‘The Nook’. Ronald Barfield – ‘Emral’. John Barnard – ‘Claremont’. Henry Bedford – ‘Elmhurst’. George Bloomfield – ‘Norton’. Jessie Bone – ‘Church Road’ (no house no or name given). Lydia Bright – Church Road. Charles Bright – ‘Glenhurst’. George Burlison & Fred Jones – ‘Oakdene’. Herbert Burton & Robert Kidd – ‘The Limes’. John Butler – ‘Stella’. Henry Collins – ‘Kenmore’. Arthur Corby – ‘1 Church Road’. William Diment – ‘Mizpah’. Emma Dougall & Elizabeth Jones – ‘Fenella’. Herbert Ford & Kathleen Harvey – ‘Ferndale’. Donald Hardy – “Hazel”. George Hazelton – “Hazeldene”. James Hunt – “Ivy Dene”. Eliza Hurcombe & Arthur Lacey – ‘Miami’. Cyril Kettle – ‘Edencroft’. Isobel & Constance Lay – ‘St Kilda’. Arthur Lewis – ‘Cleethorpes’. William Lusby – ‘Dudley’. Esther Mesnard – ‘Estherville’. John Moss – ‘Acacia’. George Newman – ‘Sylvane’. Alfred Oakley – ‘1 Church Road’. William Oakley – ‘Llanberis’. Arthur Roberts – ‘Keston’. Walter Robinson – ‘21 Church Road’. Charles Simons – ‘Aurora’. Henry Smith – ‘20 Church Road’. William Smith – ‘Novana’. Smith – ‘The Cabin’. Samuel Stocks – ‘Valetta’. Katherine Stone – ‘Dudley’. George Walken – ‘Glenmar’. George Williams – ‘Whetstone’. Horace Willmar – ‘Fairlight’. Louis Yates – ‘Elmbank’. Unlike some of the contributors I am not a researcher having neither the patience nor motivation for such arduous tasks and only write from my memories, which may or may not be totally accurate plus items I have read. However, the matter of School Lane/Church Rd. has stirred my memories and causes me to speculate as to the cause of the apparent confusion in this matter. The road existed in the 1800s probably before the school was built later in the century, yet the church preceded this by many centuries and would logically explain the name of Church Rd. 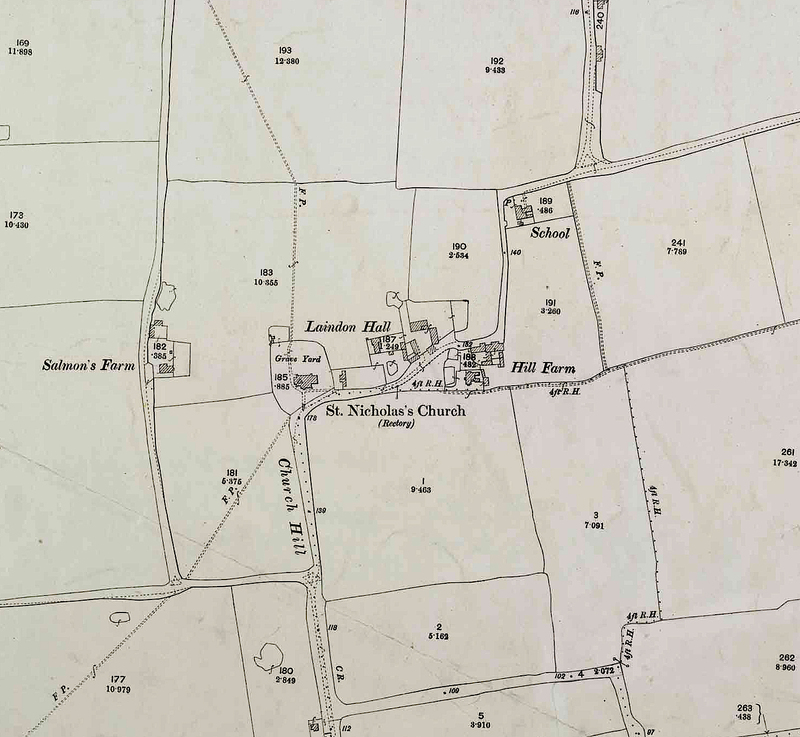 It would appear that its name was changed to School Lane as around the turn of the century as the titles of the land sales from the Church Commissioners to Eldred Buckenham and then onwards to A.E.Palmer and that the mortgages effected by the Billericay Rural District Council were in respect of properties in School Lane. I do not remember when it was again renamed Church Rd. but it may possibly have been when the Council changed from a Rural District to an Urban District, circa 1937. I cannot surmise how it was named as Church Rd. in 1929 census and apart from the name Bright none of the names shown appear in my memory. I give below some of the families I remember living on the western side of School Lane during the 20s and 30s. Meznard–Hunt– Cooper-Barfield–Travers–Bolton– Braithwaite– Stocker–Holmes–Bright–Carpenter– Bethell. This not a complete list as there were many whose faces remain in my memory but whose names escape me Perhaps there are readers who can fill in the gaps and/or correct any errors..
Further to the mystery of School Lane/Church Rd. , Nina’s map does not actually show a road named Church Rd.. but is based on the census and electoral registers. I lived in this road in the 1920s and 1930s when my address was quite definitely School Lane. It is known that census information is often the opinion of the enumerator and may be incorrect. However I consider that title deeds of properties are verified by the Land Registry Office and would be more accurate. In this respect I will send to Ian under separate cover copy of abstract of title and a map showing this road to have been School Lane. As mentioned in a previous comment, I am sure William is correct about School Lane. However, as the information I gathered from the Census and Electoral Register only mentions Church Road, that is what I quoted. Obviously this was something to do with the officials who recorded the information at the time. In accordance with William’s comments, I have arranged to have the words “Church Road” removed from below the map as the road shown is unnamed. Many thanks to William for all his help with this one. I’m sure William is correct about School Lane. However, the Census and Electoral Registers don’t mention School Lane, but refer to it only as Church Road. The words I wrote below the map weren’t meant as an address. It was just a caption to indicates a few of the features shown. Cheers. Responding to Keith, it was certainly Mrs.Bright, (Norma’s mum) who did the fortune telling. Pre-war, I knew Norma quite well, as although she was slightly younger than me, we moved in the same social group. Also just after the war I sometimes visited the Laindon Hotel where Keith’s mum worked as a barmaid (although I believe she may have been slightly underage for such a job) and did on occasion walk home with her and another young barmaid who was lodging with Joyce. Strange how such tiny incidents remain in ones memory. One point about the Bright family living in Church Rd. Laindon from the 1911 and 1929 census records which confused me is that I live in what is now Church Rd. and did so in the 1920s when it was named School Lane. I cannot remember the date of the re-naming but I believe it was possibly in the early 1930s. I notice the address of Laindon Hall appears which was in Church Hill, could there be some possible confusion here? Further to my earlier comment in respect of Church Rd. I have just found an advertisement in the Laindon and Pitsea Recorder dated 3rd April 1936 in respect of Basildon Country Club in Basildon Rd., as ” facing School Lane” and I know for certain that Norma Bright lived there at that time.